With the increasing labor and manufacturing force overseas, many Americans are focused on only buying products that are made in the United States. 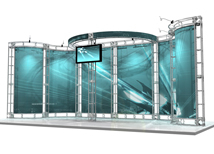 Northwest Creative Imaging offers many display systems that are Made in the US and we have compiled them into one spot so its very easy to shop for a quality US product. All of the products on this page are ACTUALLY made in the United States which means materials, labor, engineering, and printing is all from US companies and workers. Typically higher quality US products are higher in price, but surprisingly most of these displays are very affordable and fit into most budgets! The Alumalite Classic was one of the first custom modular displays introduced to the market. It was instantly successful and continues to be one of the most popular options because of the price and quality! 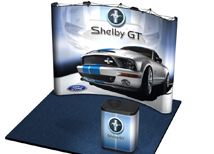 Classic Pop Ups are the original and most popular portable displays on the market. Our Classic line is made in the USA, while maintaining an affordable price point! All kits include a shipping case and lights! Contender banner stands are constructed, engineered, and printed in the US. There are many sizes available and the hardware is available in black or silver. Turnaround time is only 3 days! Orbus truss systems are made in the United States in the mid-west. Some small components are manufactured overseas but the majority of manufacturing is completed in the United States! Custom designs available! 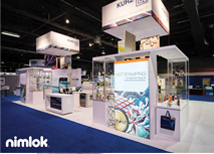 All of our trade show flooring products are manufactured in the United States. We offer multiple styles in almost any size. 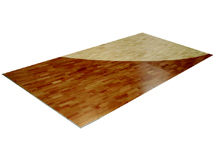 Since trade show flooring is made in the USA turnaround time is very quick! Most of our custom displays are made in the northwest and are close to 100% US made. 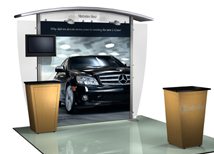 These custom displays can be configured to meet your companies strict trade show requirements! Pascale exhibits are one of the premier displays in the United States. Every display is 95% US made and 100% engineered in the US. 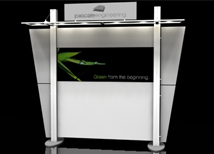 Pascale systems are some of the easiest hybrid displays to assemble! As a US company, Northwest Creative Imaging tries to carry as many products that are made in the United States. We do this to support local manufacturing and to insure quality construction. Products that are made in the US offer many advantages over some imported products. US displays are easier to customize because US companies have more flexibility. Also manufacturing and printing can be done very quickly. If an imported product is out of stock it can take months to get the product back in stock, while a US made product can simply make the product to order. 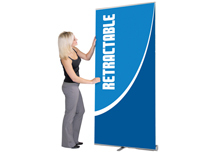 Please check out our entire selection of portable trade show displays to find the perfect product for your company! Many Americans are concerned with all the money that is sent overseas because so much is imported from China and Asian. When a US made display is purchased the trickle down economic effect happens creating more income for US workers and companies which helps generate more economic stimulation and tax revenue. While some of our other products are imported, we work with US importers to keep more money in the US.